Buy Natures Aid Glucosamine Sulphate 2KCL 1000mg - 90 tablets in the UK from our online shop or directly from our independent Scottish store. Glucosamine Sulphate 2KCL 1000mg with Vitamin C.
Natures Aid Glucosamine Sulphate is Free From Artificial Flavours, Colours & Preservatives, Lactose, Yeast & Gluten. Take 1 -2 tablets a day with food. Do not exceed the recommended intake. As official Natures Aid stockist, we sell genuine Joint & Bone Support directly from our shop in Scotland and online throughout the UK. Where can you buy real Glucosamine Sulphate 1000mg safely online? 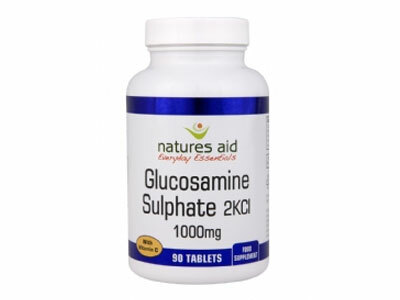 If you are wondering where you can buy Natures Aid Glucosamine Sulphate 2KCL 1000mg - 90 tablets safely online in the UK, then shop with us. We are an actual health foods shop; with real people selling real foods and products. Our award-winning independent shop is located in Stirling, Scotland since 1976. You can buy our Natures Aid nutritional supplements and other genuine Joint & Bone Support in store or safely place an order with us online or over the phone. Glucosamine Sulphate 1000mg - Natures Aid Glucosamine Sulphate 2KCL 1000mg - 90 tablets in Joint & Bone Support and Herbal Remedies, Tinctures & Supplements.